This is the diffraction limit of the telescope, namely 0.05" for d = 2.4 m, or 0.013" for d = 10 m. Each speckle thus has the small size of the Airy disk expected in the absence of atmospheric turbulence! There are thus ~500 spatial elements across the two-dimensional image at the focus of our 2.4-m telescope. Only some of these will be bright (constructive interference); other elements will be dark (destructive interference). In general the bright spots (speckles) will be located randomly in the image plane and they will vary with time in location, brightness and number. Each speckle can be interpreted as an image of the point source. If the source consists solely of two closely spaced stars, the light from each would pass through the same atmosphere cells and hence be refracted similarly. Each speckle would thus become a double speckle, or an "image" of the double star. If the source has an arbitrary shape, each speckle will have that shape, but with 0.05" resolution. Or more correctly stated, each speckle will be a convolution of the source shape and the 0.05" Airy disk. 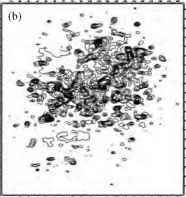 An extreme (and improbable) example of the speckle phenomenon is shown in Fig. 8c. In this case, the phase delays, for an instant of time, happen to yield a plane wave with a fixed angle, do = k/d0 across the entire telescope aperture. The wavefront momentarily mimics a plane wave from an offset source. The telescope lens will thus focus this wave perfectly with the full resolution of the lens, Ad = k/d ~ 0.05" for d = 2.4 m, but at a slightly offset position. Thus there is only one speckle, and it is the image. This actually approximates the effect for a telescope that is comparable to or smaller than the isopatch size (0.1 m) because the light entering the telescope at a given time passes through only one isopatch. 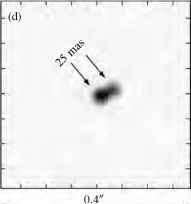 However, averaged over time, the image appears blurred because the atmospheric density enhancements are carried by winds across the telescope aperture. At speeds of order 5 m/s, they will move the distance of one cell in a time of about (0.1 m)/(5 m/s) = 20 ms. Thus the single image of our small telescope will move around rapidly within the overall image in this characteristic time. The 20 ms time is not much faster than the temporal resolution of the eye, so one can actually see the star image bouncing around when looking through a small telescope. extent is almost 3". In fact, it is the summation of 128 short (~10 ms) exposures, one of which is shown in Fig. 9b. 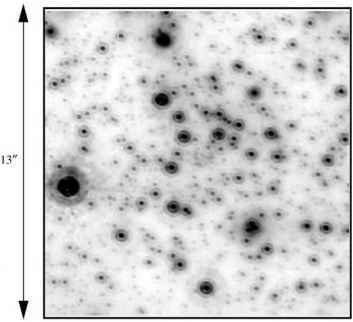 In the latter specklegram, one can easily see the individual speckles, each of which is a diffraction limited (0.067") mini-image of the binary star system. One can not see the binary in this image because the number of photons in a given speckle is so small. However, the information is embedded in the thousands of speckles in the 128 exposures. In the technique known as speckle interferometry, a series of short exposures (e.g., 10 ms) is used to capture the speckles. Keeping in mind that each speckle is a diffraction limited image of the source, the quality of this image may be enhanced by superimposing lots of the speckles in one exposure and summing the counts in them. This improves the strength and the precision of the result. 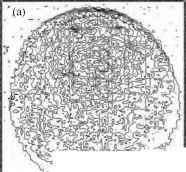 One further improves the quality by carrying out this summation on each of the hundreds or thousands of short exposures and superimposing and summing the results into a single diffraction-limited image. Alternatively, one may choose to use only the brightest speckle in each exposure for the superimposition/summation process. 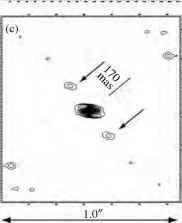 The resultant high-resolution image of the source can reveal significant structure, such as a finite-sized circular disk in the case of a nearby star or a double image in the case of a binary star system. A necessary condition for the retrieval of an image is that multiple photons (at least two) contribute to each speckle; otherwise the desired angular information is not contained in the individual speckles and is thus not retrievable. The speckle technique can therefore be used only for the brighter celestial objects. We show in Fig. 9c a reconstructed image of HR 4689 derived from the 128 exposures similar to Fig. 9b. It was obtained with an autocorrelation method. The brighter of the two stars is at the location of the strong central peak. The fainter star in the binary is represented by one of the two fainter peaks to the upper left (NE) or lower right (SW), marked with arrows. The fainter star is found to lie only 0.17" from the brighter star. The width of the individual peaks is only about 0.067", the diffraction limit for a 2.34-m telescope. This is a remarkable result from observations where the overall image size is almost 3" (Fig. 9a). The ambiguity in the location of the fainter star in Fig. 9c is a natural consequence of the autocorrelation method. An autocorrelation tests the correlation of the image with itself for all possible x-y (left/right and up/down) offsets between the two (identical) images. See (5) for definition of the one-dimensional correlation function. The plotted intensities in Fig. 9c are the values of the autocorrelations at the various offsets; position on the plot represents the x-y offset. The autocorrelation value will be greatest when the offset is zero because every speckle will be matched with itself and the correlation will be perfect. This is the central peak in Fig. 9c. The smaller side peaks arise at the two offsets where one of the two stars in the image overlaps the other. Finally, we show in Fig. 9d a reconstruction by a different method of the binary 41 Dra, which reveals a stellar separation of only 0.025". Speckle interferometry is an a posteriori method of correcting for atmospheric turbulence; the images are constructed after the observations. In contrast it is possible to actively correct the wavefront to its original planar form, as we now discuss. Under certain circumstances it is possible to actively control the optics of a telescope during observations to counteract atmospheric turbulence. This is known as adaptive optics. Such systems must also detect the state of the atmosphere so that the proper corrections may be applied. In an adaptive-optics system, the non-planar wavefront is corrected in real time prior to its arrival at the image plane. 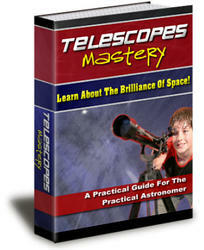 If successful, the telescope would then yield point-like images with the theoretical resolution of the telescope. Active wavefront correction has been accomplished with the use of a deformable mirror placed in the light beam after it is collimated by the telescope optics. The instantaneous shape of the wavefront is independently measured (as described below), and this is used to change the mirror shape to correct for the atmospheric defocusing. These corrections must be applied every few milliseconds to keep up with the effect of the turbulence. A typical mirror might have diameter 0.1m and several hundred tiny electrically driven pistons (actuators) which adjust the height of the reflecting surface by up to several micrometers in several microseconds. The function of the deformable mirror is simple to understand. If the wavefront in a given region is delayed, the mirror surface in that region is moved forward to shorten the optical path relative to other positions (Fig. 8d). This can be done anywhere in the optical path where the "rays" from the various portions of the initial wavefront are separated, i.e., they are not at a focus. The system may also contain a separate movable flat mirror to move the image centroid in two dimensions to keep it at a single position in the focal plane. This reduces the excursions required of the actuators in the deformable mirror. In a simpler system, the flat mirror is used alone to track the brightest speckles, which can provide improved images on its own. Sensing the wavefront shape Such a system requires knowledge of the instantaneous state of the atmosphere on time scales of ~ 1 ms. This is done by sensing the instantaneous shape of the wavefront each millisecond. The faint stars studied by many astronomers do not provide sufficient light for this. It is necessary therefore to use a bright reference star. Unfortunately, this star must lie within a few arcseconds of the real star if the same portion of the atmosphere is to be sampled. This is a very unlikely occurrence. Thus a bright artificial star is required. One technique is to use a ground-based laser. 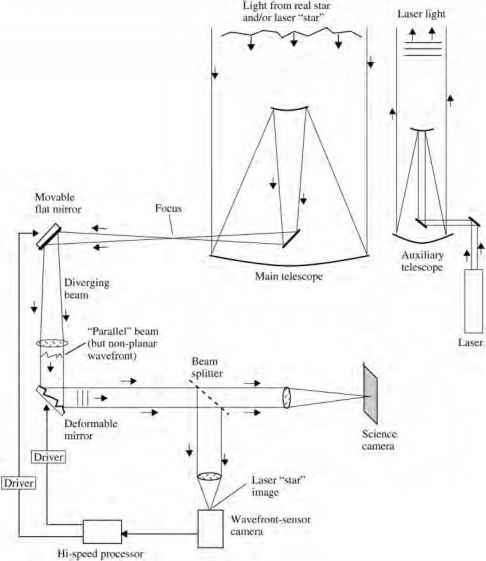 Its beam may be projected into the sky with either the main telescope or a smaller auxiliary telescope. The beam may be used to illuminate the thin layer of sodium gas found near the top of the atmosphere, at 90-km altitude in the mesosphere. In this case, the laser frequency is set to the frequency of the sodium line so that it excites the sodium atoms which radiate and thus serve as an artificial star. The laser does not radiate continuously; it sends brief flashes during which time the normal star is not studied. This avoids contamination of the true starlight by laser light. The flash from the artificial laser "star" is detected and analyzed for the wavefront distortions. The appropriate error signals are then sent to the deformable mirror. The sensing and analysis of the wavefront shape may be carried out in a number of different ways. One of these is the Hartmann wavefront sensor. A mosaic of small "lenslets" sample the wavefront and project the image of the point source on a portion of the detector plane (Fig. 10). The locations of the several images yields the tilts of the sampled portions of the wavefront. Together, the array of lenslets samples the tilts of all the isophase patches. The shape of the wavefront can be determined from these tilts. Other methods for sampling the wavefront make use of interference techniques. Unfortunately, the physical location of the laser star is not fixed in time; it wanders back and forth a bit due to the turbulence cells encountered by the laser beam on its upward path. The data from the laser star can thus not be used to control the flat movable mirror that adjusts the image centroid. The light from a real star must be used for this purpose. A relatively faint star can be used if the laser star is used to adjust the deformable mirror at the same time. Figure 5.11. Complete adaptive optics system. A small telescope directs laser light to a point high in the atmosphere to create an artificial laser "star". The light from the real star, or intermittently from the laser star, arrives at the main telescope and is directed to a movable flat mirror which can tip and tilt to correct for centroid displacement of the image. The light is then directed to a deformable mirror which corrects for non-planarity of the wavefront. (The light from the laser-star is used for this.) 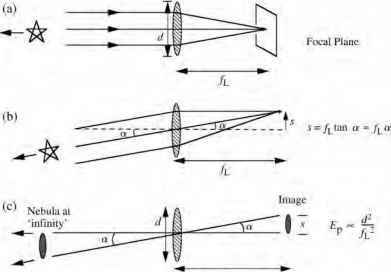 The light beam is then split with a portion directed to a wavefront sensor, e.g., the Hartmann sensor (Fig. 10), the output of which is used to control the two correcting mirrors. The balance of the light is directed to the science camera. beam is split into a wavefront-sensing beam and a science beam. The former is sent to the wavefront-sensing hardware and analysis software which detect deviations from a planar wave with proper centroid location. Corrections are then applied to the two mirrors. The modified beam is then sensed; it should be more planar, but the atmosphere will have changed somewhat. The process continues in this closed feedback-loop mode. The desired result is an image that closely approximates that expected from the telescope in the absence of atmospheric turbulence. Adaptive optics systems are now producing results. The spectacular image of the galactic center (Fig. 12) taken with the 3.6-m CFHT telescope in Hawaii is an example. The smallest star images are only 0.13" FWHM in size and about 1000 stars are visible in the original image.